SRI, or other brand NPD. with differentiation between saturated and unsaturated Carbon bonds. capability for all modes of NPD and TID detection). 0.32 mm fused silica column and simple interchangeability from one detection mode to another. STAND-ALONE TRANSDUCERS and DETECTION MODULES. unique selective responses to heteroatom compounds (Nitrogen, Phosphorus, Oxygenates, Halogenates, Nitro-compounds, Lead, Tin, Silicon) and Pyrrole vs. Pyridine functional groups. 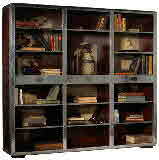 inexpensive, simple equipment design, easy to operate and maintain. The tower can accommodate DET hex flanged ion sources such that the ion source is positioned on the axis of a collector electrode cylinder. For a complete detector, add an Ion Source (USD350) to the following assemblies. NPDITID/FID Tower Assembly, part #010-860-55, $1800 USD. DET hardware and ion sources are compatible with Thermo's NPD electronics which provides Constant Current ion source heating and a wide range of polarization voltage selections. This combination of DEThardware and Thermo NPD electronics provides the most versatile NPDITID detection currently available. Different modes of detection are achieved by simple changes in the type of ion source, and in the type of detector gases. NPDITID/FID Tower Assembly, part #010-860-20, $1550 USD. DET hardware and ion sources are compatible with Varian's TSD electronics which provides Constant Current ion source heating at a fixed polarization of -4 V.
For modes of detection other than NPD, a stand-alone DET Constant Current Supply provides a selection of higher polarisation voltages which provide more sensitive detection than the Varian supply. Optional DET Current Supply, part #001901-01 (115Vac), $1760. NPDITID/FID Tower Assembly, part #050-864-98, $2350 USD. 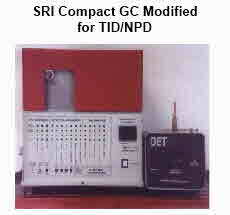 DET hardware is compatible with signal measurement using SRI's FID/NPD amplifier. DET ion sources with a bare wire termination can be powered with SRI's NPD electronics, but setting power levels is not very user friendly. 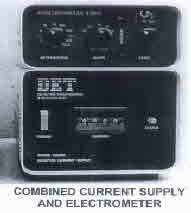 An improvement is to use the stand-alone DET Current Supply described above, and ion sources with a Twinex connector . . . as is standard on Agilent, Thermo, and Varian instruments. NPD/TID/Remote FID/FTID Tower Assembly, part #040-862-12, $1850 USD. DET hardware is not compatible with the 5890 detector electronics,so the stand-alone DET Current Supply and a stand-alone Electrometer (Keithley 6480 Picoammeter recommended) are required. Principle of Detection : Samples combusted in a H2-CH4-Air flame. 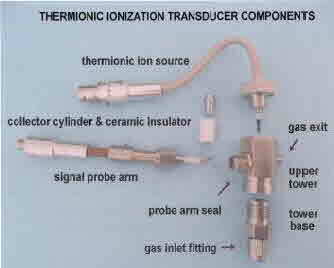 Electronegative combustion products re-ionised by thermionic surface ionisation downstream of the flame. TID-1 and TID-3 : modes of detectuion are simple, inexpensive modifactions of Agilent 6890 or DET NPD equipment. Both operated with a detector environment of either N2 or Air ( NO H2 required ) depending on the selectivity required. The ceramic coated TID-1 source is electrically heated to an operating temp of 400-600C, while TID-3 is 600-800C. Both ion sources are polarised at -45V with respect to the surrounding ion collector. TID-1 and TID-3 ion source configurations fit into the Agilent 6890 NPD equipment and into DET NPD equipment designed to mount onto HP5890, SRI8610C or Varian GCs. Negative ion detection signals can be measured with the Agilent 6890 NPD elctrometer, Varian TSD electrometer, SRI FID/NPD electrometer or with a DET electrometer. if you Search and can’t find it . . . ASK !